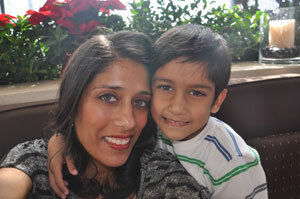 Every time Sapna Singh, 36, of Laguna Hills, California, looks at her beautiful 5-year-old son, she thinks about how her mother’s selfless act allowed her to experience the true joy of motherhood. Every time Sapna Singh, 36, looks at her beautiful 5-year-old son, she thinks about how her mother’s selfless act allowed her to experience the true joy of motherhood. Since I was young, I wanted kids. I had to be a mother. I was diagnosed with lupus and a blood clotting disorder in 1999 and I knew having a child might not be easy for me, but I was up for the challenge. After trying for three years and suffering several miscarriages, I felt like giving up. I couldn’t share my heartache with others because I didn’t want people feeling sorry for me. The only people who gave me hope were my husband, Sonny, and my mother. After I suffered my last miscarriage in August of 2005, my mom said she wanted me to stop trying. Instead, she’d be my gestational surrogate. At first this sounded like the strangest thing to me. It was hard for me to come to terms with not being able to carry my own child. I felt like a failure. I’d never be able to feel my baby kick inside me or see my growing belly. But then I thought, “Does carrying a child really make you a mother?” No. It’s all the ups and downs of raising a child that makes you a parent. Here was an opportunity for me to possibly become a mother. After thinking it over for the rest of the year, my husband and I decided to take my mom up on the offer. In January of 2006, my mom went through a battery of tests and the doctor told us that at age 54, my mother was a better candidate to carry my child than I was. 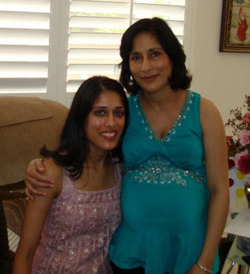 My mom received hormone shots to reverse her menopause and thanks to in vitro fertilization (IVF), two embryos were implanted in her uterus. After a blood test confirmed her pregnancy, I called my husband with the news. “We’re pregnant!” He was speechless. The ultrasounds looked perfect and in April we found out we were having a boy. The baby was conceived with my egg and my husband’s sperm, so he was our biological child. Our son, Syrus, was born perfectly healthy one month early through a caesarean section. I filmed the whole birth through my tears. I was the first one to hold my gorgeous dark-haired baby and I’ll never forget that moment. Syrus, now 5, is close to his grandmother — my courageous and beautiful mother. I’m so proud to be her daughter. She made a tremendous sacrifice out of love just to see me happy. My mom has given me the gift of life and for that I am truly the luckiest woman alive. Thankfully, we received more good fortune. We had twin boys 22 months ago through a different surrogate — our cousin — and now we juggle three kids under the age of five. It’s busy but I’m grateful and I love every minute of being a mom. Don’t gamble with your health. Understand that life doesn’t always go according to your initial plan and that’s fine. Be open-minded and let people help you.